The list of complaints was long: Inadequate teaching facilities, lack of resident participation, arbitrary distribution of premium payments by the institution’s administration and forced residence in the institutional facilities during job training programs. In the early 1970s, the Bremen rehabilitative institution Friedehorst came under severe criticism by various disability advocate groups and youth clubs.1 To indicate the extent of the misconduct to local politicians, the journalist Gerhard Tersteegen compiled a compendium of the institutional transgressions. His documentation, entitled Heimideologie contra Integration [Institutional ideology versus integration], is only one of the previously unpublished sources featured in Quellen zur Geschichte von Menschen mit Behinderungen (QGMB) that documents the changing cultural realities of people with disabilities in Modern Germany and unearths their constant claims to agency. QGMB follows the lead of various other disability historians to open the disability archive and eliminate barriers to explore the history of people with disabilities. Whereas American efforts already culminated in a digital disability museum as early as 2000 and other pioneering source platforms have made published journals of the German disability movement (Krüppelbewegung)2 available, unpublished primary material that offers glimpses into the intricate realities of people with disabilities have remained unavailable for larger audiences in Germany – or reserved for the privileged eyes of historians. QGMB attempts to further open the archive for a general audience. edition is didactically designed for use in both high schools and universities.3 Apart from a search function, the categorization of sources reflects different facets of the phenomena collectively referred to as Behinderung. Even more, the selected material and its encoding permit teachers to give students independent research tasks. As the documents are chosen to offer a variety of viewpoints on a given topic, and balance each other rather than require to be used as a unit, different levels of depth can be achieved according to the teachers, students and curricular demands. To fulfill the demand for multiperspectivity in history didactics, both non-disabled commentators and individuals categorized as disabled are collected in the source edition. Lecturers and high school teacher can select the amount of sources and which viewpoints to look at, and also whether to use the finely encoded sources in more independent or supervised teaching formats. The project is initially derived from research project People with Disabilities in Germany after 1945. Self-determination and participation in two German states in comparative perspective. A contribution to Disability History that was funded by the German Research Foundation and headed by Gabriele Lingelbach at Kiel University. While the project was finalized at the end of 2017, QGMB assembles the project’s findings as a central archive. However, it is not only a testimony to the individual dissertations by Jan Stoll (Disability Self-advocacy movements in West Germany),4 Sebastian Schlund (West German Parasports),5 Bertold Scharf (Working environments of people with disabilities in the GDR)6 that makes their results available and sets the stage for new disability history projects in Kiel. While the sources are currently categorized according the domains of activism, sports, work, alongside legal texts and stereotypes, the source edition is devised to be enlarged – in categories, periods and territories. Screenshot of the QGMB web site. Particular attention was paid to long-term availability, searchability and intertextual relations. The documents were encoded with the standard for digital editions in the humanities - TEI. TEI allows not only to mark up the structure of the text but also textual elements like persons, places etc., so they can be directly identified. The faceted search on the web site works like a register and allows cross-referencing of persons, institutions, organizations, key words, places and laws. Each of these is referenced – if possible – with a permanent link to the respective entry in the German national library (DNB). Moreover, in contrast to a printed source edition, it is possible to extend the edition in the future. The usage of TEI also facilities upcoming research: In TEI, different terminologies for disabilities and people with disabilities are indicated and could serve as a foundation for a corpus that helps to uncover discursive changes in the naming and, hence, in the construction, ascription and disavowal of the complex of dis/ability. These encoded concepts include the GDR’s Geschädigte [damaged/defective], the male veterans’ self-description of Versehrte [permanently wounded] and the Sorgenkinder [problem children] that became a frequent reference point after the Thalidomide scandal in early 1960s West Germany. The encoding makes the documents not only machine-readable and searchable, but also qualified with meta-data (bibliographical information, key words and notes on the edition process and responsibilities). The documents will be published in the TextGrid Repository, a digital preservation archive for XML/TEI encoded humanities research data, so the documents will be available also if the web version site should not exist anymore. The web site is barrier-free and accessible for blind and visually impaired people: It is readable for a screen reader and every picture is linked with an alternative description. Unfortunately, it is not accessible to non-German-speaking people and people with learning difficulties, there is no English version and the texts are not translated in easy-to-understand language. In its current inception phase, QGMB comprises 37 very diverse sources. 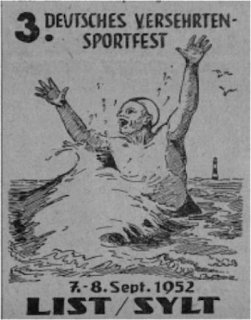 From complaints about institutional repression, such as Heimideologie contra Integration, to leaflets written by the German disability movement, to parasport visuals that speak to the changing cultural ascriptions of mental or physical dis/ability. Moreover, the range is from letters of complaint directed at federal ministries, official advertisements for the Kriegsversehrtenspiele to satirical obituaries of the disability movement for the public service TV lottery Aktion Sorgenkind which was often regarded as paternalistic. Newspaper articles show how the subject was discussed in the public and abstracts from laws and regulations show the handling in politics. Each individual source is amended with a separate commentary by the disability historians of the Kiel project. These commentaries frame the source and reference further research on the topic. Poster for the 3. Deutsches Versehrtensportfest [3rd German tournament for permanently wounded veterans] on the German island of Sylt. 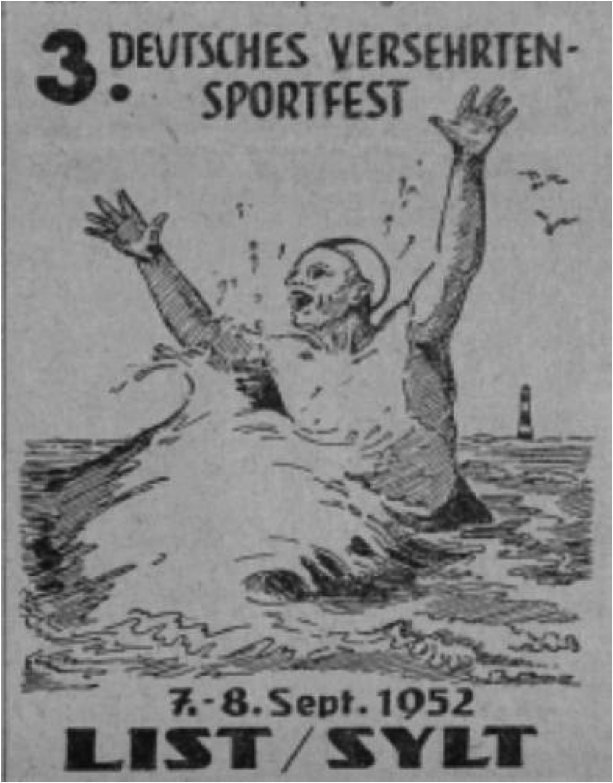 This ad depicts an athletic swimmer joyously waving his arms. The impaired part of his body, however, remains unseen and below the waves of the North Sea. We hope that we have created a helpful resource for teachers and students to learn more about disability history and provided encouragement to do more in this field. Hopefully, the source edition will only be the beginning of a process. Raphael Rössel/ Bertold Scharf (2018): A Source Edition of the History of People with Disabilities in Germany after 1945. A contribution to Public Disability History. In: Public Disability History 3 (2018) 8.